The best place to start is the material the wire's made out of. There are two main materials you'll find in automotive wire: copper and aluminum. They each have advantages and drawbacks you'll need to be aware of when purchasing for a shop. For example, copper is more conductive, flexible, and unlikely to corrode than aluminum wire. But copper wire weighs more and is currently more prone to price fluctuations, so you'll need a good distributor to keep your costs low. Aluminum, by contrast, is lighter and cheaper, but it's less durable and more likely to corrode or develop more electrical resistance over time. Next up is the "load" a wire can take. This is expressed in amperes, often shortened to "amps," and the total amount of electricity that can flow through the wire is expressed in amperage. You should know the current rating of every single wire that comes into your shop and ensure that it's clearly labeled. Overloading a wire is enormously dangerous for both your staff and your customers; a wire with the wrong current rating can short out, stalling equipment in dangerous locations, damaging important systems, and even starting fires in extreme cases. So know your amps, and always double-check that the automotive wire you're ordering can take the load. Similarly, check with the shop to see what relays, fuses, circuit breakers, and other overload protection they're using, and similarly make sure you know what connectors the shop will use for their work. Too many amps can short out connectors, too. The next step to be aware of is automotive wire gauge. The lower the number of a wire's gauge, the thicker a wire is. As a rule of thumb, the further your wire needs to go in your design or repair, or the more electricity that needs to flow through it, the lower the gauge needs to be. If you're purchasing for repairs, make a point of having the technical manuals for any tractors, lawn equipment, and other vehicles you service handy. The manual often lays out exactly what gauge of wires are used for which components, so you'll be able to keep the necessary wires in stock. Wires don't just connect themselves, as much as mechanics wish they would. There are two kinds of connections: Soldered and solderless. Solderless connections often use terminals, most commonly crimp terminals, to make connections. Solder can be dangerous, since it's hot metal, but talk with the team down at the shop and see what type of connections you need. 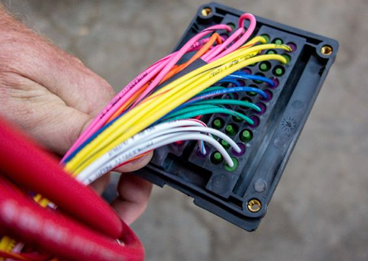 One of the best ways to organize your shop and make common repair and construction jobs easy to do is to choose a different color for each type of automotive wire. 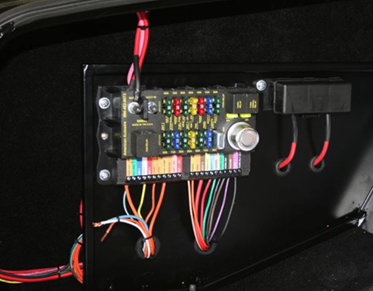 Some distributors will even offer custom wire striping for your order, allowing you to organize. Learn more about our wire and cable products and our custom wire striping services. We'll help you secure every wire your shop needs, at the right price.